The Belgian artist Jean Delville (1867 – 1953) was among the participating artists that feverishly shared Josephin Peladan’s beliefs in the spiritual power of art. 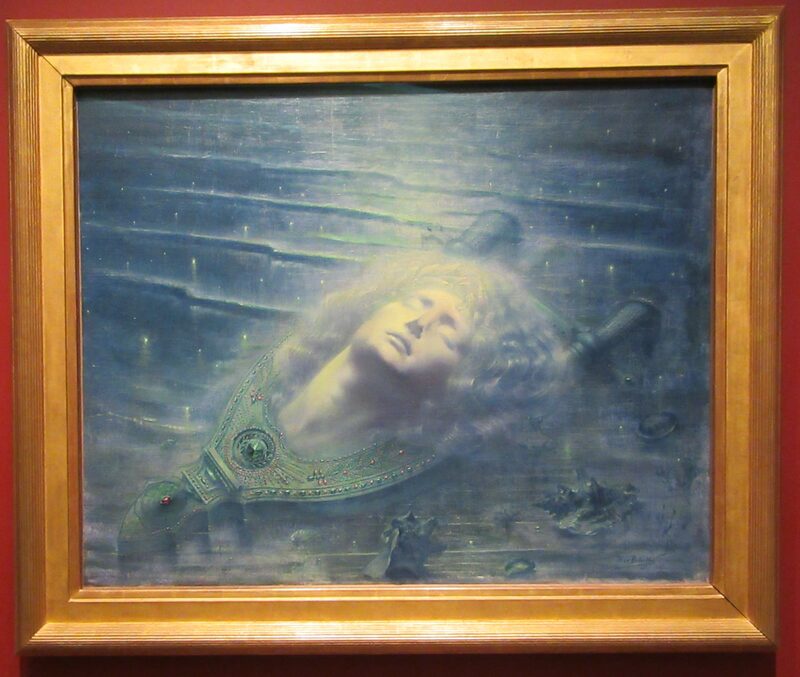 Delville exhibited in the first four Salons de la Rose+Croix, earning particular admiration in 1894 for The Death Of Orpheus (1893). During the 19th century, Orpheus, the supernaturally talented poet of classical Western mythology, was a popular paradigm for the artist as enchanter, seer, and martyr whose creations transcend death. In one myth, after Orpheus is dismembered by wild female followers of Dionysus — the god of wine, fertility and madness — his head floats downriver, still singing, and becomes an oracle. Orpheus’s androgynous features, reportedly modeled after the artist’s wife, manifest the Symbolist belief in androgynes as ideal beings that represent the synthesis of opposites into a beautiful and perfect whole. Photographed as part of the exhibit Mystical Symbolism: The Salon de la Rose+Croix in Paris, 1892–1897, at the Guggenheim Museum in NYC.